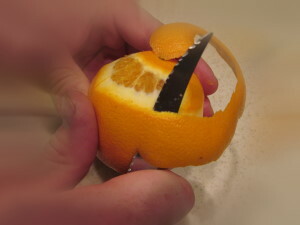 ﻿Bruce Goodman's "Don't you dare"
Dale was demonstrating to his children how to best peel an orange using a knife when he accidentally cut off his finger. They phoned for an ambulance and it set out immediately only to crash into a cyclist at an intersection. The cyclist was killed. At the cyclist’s funeral, or more particularly at the cup of tea afterwards, old Mrs Clifton choked on a cucumber sandwich and was beyond revival by the time anyone performed the Heimlich manoeuvre. At Mrs Clifton’s funeral, Jack met Rachel and they fell in love and got married and Rachel was expecting but it was an ectopic pregnancy and they lost the baby, but later they had another baby who grew up to be a tyrannical man who beat up his wife and children, and one of the children was a malfunctioning individual and murdered three people, all of whom were destined to become great artists of one sort or another, but their careers were through before they had even started. The painting that one of them was destined to paint, and never did, would have been lost in an attic for decades only to be found by a destitute widow who was trying to feed her eleven children. She could’ve sold it for millions. One of her eleven children was the great-great grandchild of Dale, who was now home from hospital minus the missing finger, and was about to demonstrate to his children once again how to best peel an orange using a knife when his wife declared vehemently DON’T YOU DARE! DON’T YOU DARE!